The inventory in Loudoun County continues to tighten. Active listings have declined, year over year, every month since July 2015. 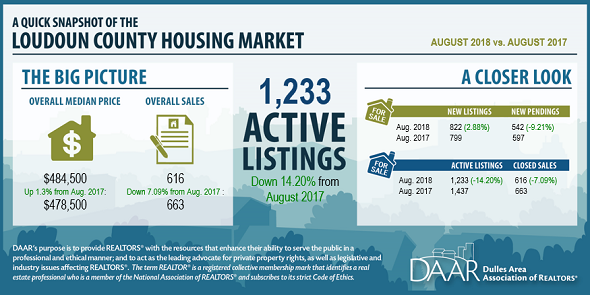 In August, there were 1,233 active listings, fewer than any August in the past decade. As a result of the low inventory, supply heading into September was 2.2 months. New listing activity increased in August versus last year (2.9 percent) as Loudoun County added 822 new homes to the market. The new listings are 2.8 percent higher than the August 5-year average, offering modest relief from the tight inventory. There were 616 closed sales in Loudoun County in August, down 7.1 percent from 663 in August of 2017. The number of closed sales is 1.5 percent higher than the 5-year August average of 607 despite the low inventory. Condo sales increased 5.2 percent to 101 in August from 96 in August of 2017. Sales of detached homes declined 14.7 percent and townhouses declined 0.9 percent from August 2017. Low inventory and higher sales resulted in the median price of home sales in Loudoun County rising to $484,500 in August, the highest August median sales value in over a decade. Similar to last month, fewer home buyers signed contracts in August 2018 compared to August 2017. New pending sales decreased 9.2 percent to 542, this was 4.6 percent less than the 5-year August average of 568. Lower pending sales may result in slower sales over the coming months. Loudoun County homes sold faster than last year, with half of August sales listing for 12 days or fewer—down six days from August 2017’s median. Loudoun County home sellers received, on average, 98.4 percent of original list price in August.